It’s not a ray gun. It’s not a vaccine gun that gave us those round immunization scars (if you have gray hair). 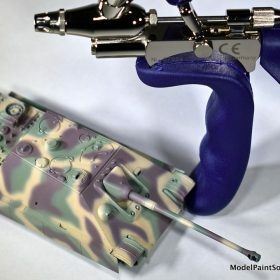 Nope, it’s an airbrush: quite possibly the handiest airbrush this modeler has ever used. The Colani is the result of a collaboration between Harder-Steenbeck and the world-renowned designer from which the brush gets it name. Luigi Colani (born August, 1928) is a Swiss-German industrial designer with a distinguished career working for companies such as Fiat, Alfa Romeo, Lancia, Volkswagen, BMW, and Ferrari. 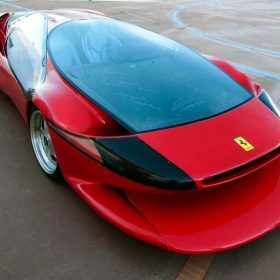 A nice example of his work is the Colani-Ferrari Testa D’oro (pictured). 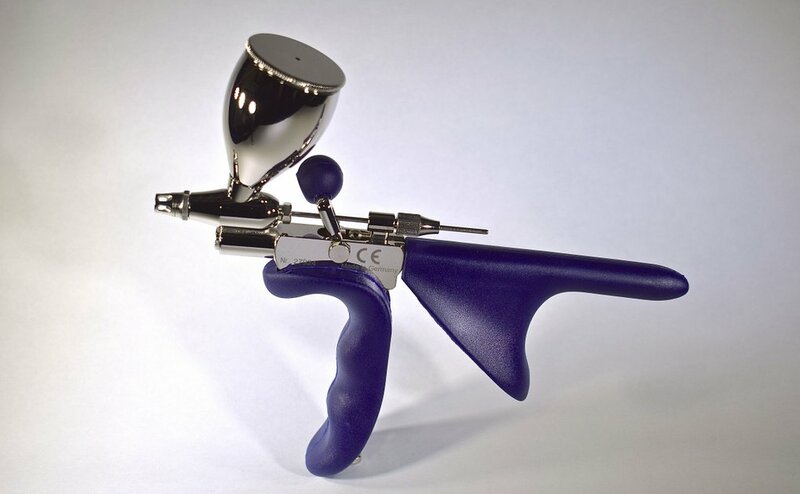 Over the course of his career Colani expanded the focus of his designs into numerous areas ranging from ballpoint pens and television sets to uniforms, trucks, a striking grand piano manufactured and sold by the Schimmel piano company and yes, airbrushes through a collaboration with Harder-Steenbeck. His unconventional designs have made him famous, not only in design circles, but also to the general public. Despite having received numerous prestigious design awards, Colani’s unconventional approach has left him largely an outsider from the mainstream of industrial design (edited from Wikipedia). Outsider or not, the collaboration between Colani and Harder-Steenbeck resulted in a really nice brush that offers features no other airbrush does. From its look to its lever action to the way it feels in the hand: the Colani is in a category of its own. 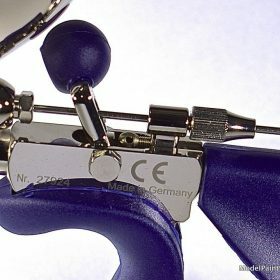 Fortunately it features the same high degree of German craftsmanship and engineering, as does the entire line of Harder&Steenbeck brushes. Most notably, the Colani has a novel lever-action design that’s more a combination of double-action, single-action, and trigger. This ingenious but surprisingly simple design allows the point at which paint starts to flow as the lever is pulled back to be set by the user: simultaneously with the air or lagging behind the start of air flow. This has a huge effect on the ease with which a fine-line can be started and maintained. The business end of the Colani is borrowed from the Infinity allowing it to accept all of the same sized tips from the amazingly small 0.15mm, through the 0.20 and 0.40, all the way up to the production level 0.60mm: with one brush. The brush comes with a 0.40mm tip. Since a major component of the Colani is copied from the Infinity, it takes he same line up of paint cups including the 0.5ml Micro Cup, 2ml, 5ml, and 15ml cups (supplied with the brush). Pictured is my Colani fitted with a 2ml cup. 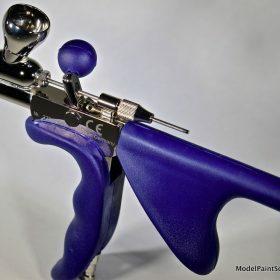 One of the more unique features of the Colani is the positioning of the trigger on top of the brush with the balled-lever projecting over the right side of the body. This lever arrangement, in combination with the rear portion of the handle that swivels, allows your hand to assume a position that’s both relaxed and solid. With the extended front grip, the Colani has a very low center of gravity adding to the stability of the brush in the hand. For those with big paws, spacers are provided that extend the length of the handle appreciably. If you prefer to use your left paw, the lever can be moved to the appropriate side of the brush quickly and easily. To do so, the needle and two screws are removed, the lever is flipped, and the brush is re-assembled. A handy tool is provided to assist in removing the screws. For some modelers the ability to configure the Colani for Left-handed use is a real game-changer. For me this is the most intriguing feature of the Colani and really sets it apart from every other brush I’ve used. 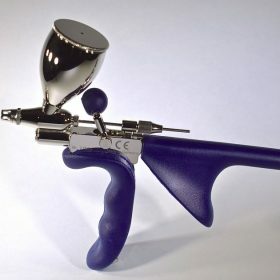 Trigger-gripped airbrushes like Grex have a distinct 2-stage trigger: first air flow (1st stage) then a detente followed by the start of paint (2nd stage). 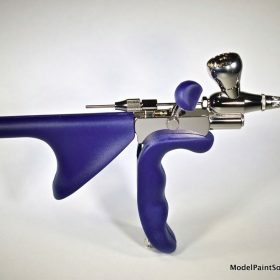 The sequencing of Air followed by Paint as the trigger is pulled back results in a lot of airflow over the nozzle/needle after they’re covered in paint: every time the trigger is cycled. This leads to increased tip dry in general and more difficulty starting and maintaining fine lines. In stark contrast to the two-stage trigger is the design utilized by the Colani. There are no detentes as the lever is pulled back: just a smooth very solid-feeling, rearward motion ending in a soft stop. There is no need to push down or sideways on the lever: just back. The instant the lever is pulled back air begins to flow. The flow of paint, however, can be set by the user to start simultaneously with the air flow or to lag behind by a small degree of lever movement. This delay in paint flow can be set to occur at ~0.5 to 2mm (or more) of lever movement after the start of air flow. A fine-line is delivered with a small movement of the lever that gets progressively larger (more paint) as the lever is pulled back farther: like a double action. With the Colani set for simultaneous air and paint I find that fine lines are very easy to initiate and control. In addition, there’s less tip dry as the wet nozzle/needle isn’t blasted with dry air every time the lever is closed as it is with two-stage trigger brushes. If, however, you prefer to have air flowing before paint starts to flow, as with a conventional double-action airbrush, the Colani action can be adjusted to your liking. 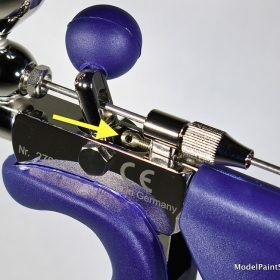 The small, brass, set screw with a rounded head and small hole (arrow) controls the start of paint flow as the lever is moved rearward. By simply turning the set screw with the tool provided, paint flow can be adjusted to start simultaneously with airflow or to lag behind it. The amount of lag (short to long) can be fine-tuned to your need/style with a few turns of the set screw: awesome design. 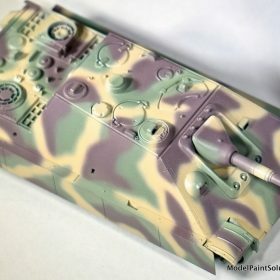 To give the Colani a proper road test, I fitted mine with a 2ml cup and a 0.15mm tip and shot the scheme on this Trumpeter 1/72 Jadgepanther using Mission Models primer and paints. Since the business end of the Colani is essentially an Infinity, cleaning is just as simple and easy as with other H&S airbrushes. 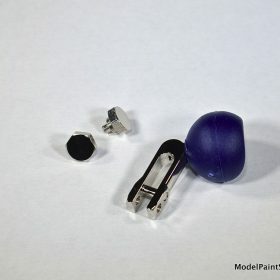 Moreover, with a simple adapter, the H&S airbrush holder easily accepts the Colani permitting it to be placed wherever on your workbench you need it. The Colani is an awesome brush that incorporates multiple novel deigns tied together with good, solid engineering. Now that I’ve tested one in my shop, a Colani is the newest addition to my modeling workbench and to the selection of H&S brushes offered by Model Paint Solutions. If you have any questions about the Colani, drop me a line at john@modelpaintsol.com.